So, I recently had to switch to using Ubuntu 16.04/Wine 1.6.2 for Yuri's Revenge and tools due to a hard drive failure, and now I am beginning to see that it's going to be a tough journey. I'm trying to replicate a custom campaign on a different RTS game on YR using FinalAlert2YR, and, well... nearly nothing appeared. the cliffs and sand a dark grass I placed was there, but nothing else. 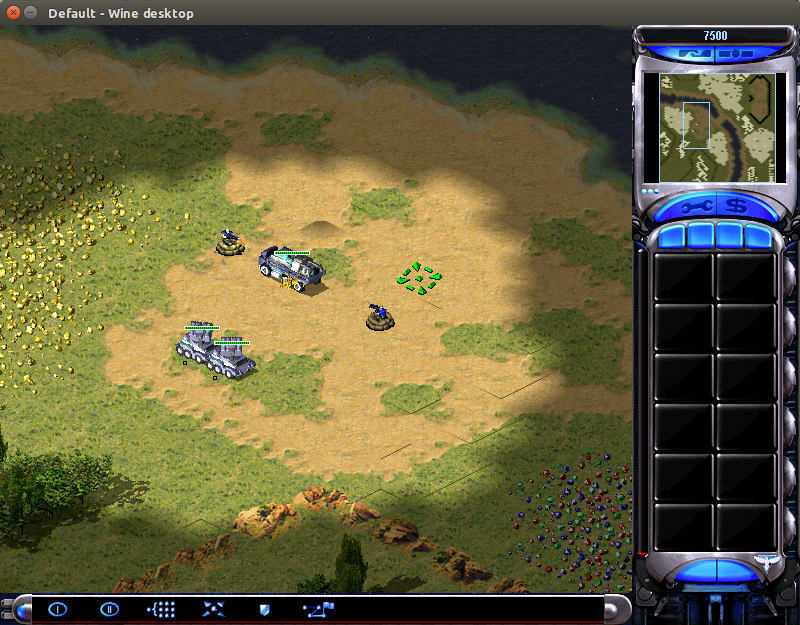 I had a couple IFVs and an MCV as starting units and an enemy outpost all included, and nearly nothing was there. Finally when I tinkered with the code I got everything to appear, but then all the units were invincible (even the infantry). All of the accessories I had put in were there in the code but initially weren't there in-game. Later on everything's there but they're invincible or something. It is, right now, a very simple map, too, with new additions to come. I want to know if anyone has the same problem by uploading the map and an image of what I saw. If you experience this too can you help in fixing it? I'm pretty blank at this point so I'd love a little help. Thanks! EDIT: I think I should also add that I know it isn't my YR. I tried another custom map on my YR and it worked fine. Everything's invincible? And fog of war. Upload the earlier map that didn't work at all. Also sorry but you can't really use FogOfWar it will eventually crash the game, on some computers its after 10 seconds, fixing it is vary complicated as it goes way deep in the game exe. Ok so stuff went missing cause in the old map you had "NewINIFormat="
I figured out the invincibility thing. It waS because I had Inert=yes. Set it to no and now they're not invincible. EDIT: Ohyeah, and Shroud=yes was what was causing the Fog of War thing. Changed that to no and fixed. Heh just when i edited my post, right so that its supposed to be is related to how Gas particles react based on name. What its actually doing beats me. Scratch that, Inert munition duh, ffs stupid me. I suppose the reason for this key is for tutorial missions maybe.